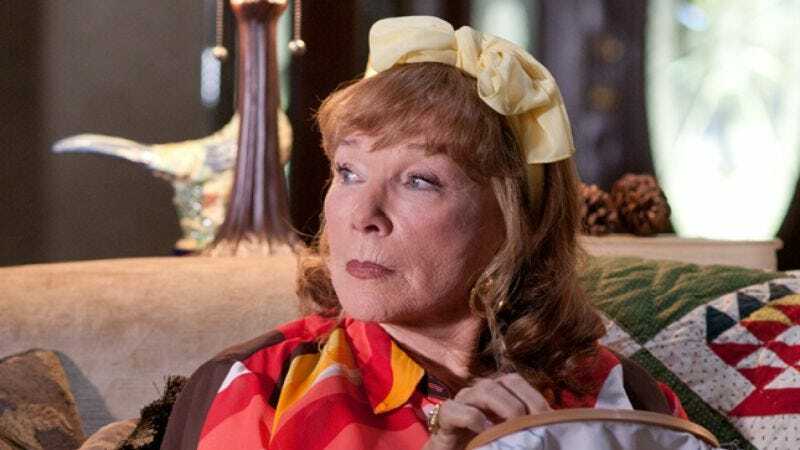 The actor: Although Shirley MacLaine has only made a handful of screen appearances in the last decade and a half, she’s suddenly a hot property, starring opposite Jack Black as a wealthy, spiteful widow in Richard Linklater’s Bernie, and shooting The Secret Life Of Walter Mitty for Ben Stiller. Meanwhile, she’s attached to half a dozen other ongoing projects. In a career stretching back almost half a century, she’s worked with Alfred Hitchcock, Billy Wilder, and William Wyler, garnering five Oscar nominations before winning in 1984 for Terms Of Endearment. Shirley MacLaine: What’s it like? I’ve seen it, but I think it was before the final cut. The A.V. Club: It’s charming, although that seems like an odd word to apply to a movie about homicide. It seems like a very sympathetic portrait of that community and that region. SM: Exactly. That’s really why I did it, because I found it so interesting that these people would not believe his confession. They decided he was adorable and loveable, and that’s all there is to it. And I thought, “Oh, Jesus!” [Laughs.] I liked that, and I liked that Richard [Linklater]’s a good student of human behavior. AVC: Your character has almost no lines for the first 20 minutes of the movie, during which she and Bernie are, so to speak, a happy couple. It’s only when things turn sour that we get extended scenes between them. SM: Well, it’s about what people thought of them; not so much about watching them enacted, but it’s what other people think. That’s what I was interested in. It’s a documentary, really. AVC: People say things about your character like, “There are people who would’ve shot her for $5,” and “Her nose was so high, she’d drown in a rainstorm.” Did you feel that you needed to see a more sympathetic side of her, even if no one else did? SM: I like making evil, bitchy people funny. I love that. Fun. I met the real Bernie—well, I talked to him on the phone from prison—and he was as adorable as Jack portrays him. AVC: Did you talk to him about your character? SM: Oh yeah. They really were meant for each other, for a time, but she got very colonialist about him, colonized his spirit. He couldn’t take it. AVC: She was generous with her money, but also made him dependent on it, and didn’t like him to spend time with other people, so he became increasingly isolated. It’s almost like the way an abusive husband behaves. SM: Yeah, but in this case, what was interesting to me was the role of money and wealth. She thought, “This is the power I exude over him, and he’s gonna obey me,” and whoa—I thought that was interesting. AVC: Does the fact that her wealth plays such a key role make this seem like an especially timely story to you? SM: Well, yeah, because that’s what makes the world go round right now. That’s what’s wrong with us. East Carthage [Texas], and the whole personage of Bernie was like a microcosm of money and power in the world. AVC: This isn’t something the movie brings to the fore, but when the people of East Carthage talk about how generous Bernie was, they’re often talking about things he bought with Marjorie Nugent’s money. SM: He was doing the same thing: He was buying their adoration. AVC: The upstairs-downstairs dynamic is central to the show. I gather you can’t say much other than that you’re playing Elizabeth McGovern’s mother, but you have said that your character brings in more of an American perspective in terms of wanting to sweep aside the past, in terms of tradition and social class. AVC: How do you stay in touch with a sense of how class affects people’s lives? It’s easy for someone in your position to insulate themselves. SM: Oh, I live pretty simply. I don’t have an assistant. I make a lot of people around me my slaves, but no assistant. AVC: You’ve said Frank Sinatra and Dean Martin did not get along with director Vincente Minnelli. SM: Oh, they couldn’t stand him. He didn’t direct actors, he directed scenery. That might be one reason. But they thought he was a walking pansy. AVC: How did you get along with him? SM: Oh, I loved Vincente. I loved him, but I’m different than Frank and Dean. The night we were shooting outside in the carnival—remember the last scene in the movie? There was this huge Ferris wheel, and it had been lit and prepared, and everything was ready. And Vincente went over and looked through the lens, and instead of saying, “Move the camera,” he said, “Move the Ferris wheel.” That’s when Dean and Frank got on a plane and went back home. They thought that was so friggin’ ridiculous, and they were right! AVC: One of the things that makes the movie work is that there’s a tension between the elaborate design, right down to the powder-blue adding machine, and the easy naturalism of the acting. SM: Oh, but see, that’s what I mean. Vincente directed props and scenery and colors and drapes and carpets. He loved directing scenery. AVC: Was the flip side of his attention to décor that the actors were left to their own devices? SM: Well, I thought it was very interesting. He didn’t say a word to me on the whole movie. He was busy directing whatever the drape was over my head. And I don’t know whether Dean and Frank—they just didn’t like a director who did that. SM: [Laughs.] I think he probably made that up, to tell you the truth, because that was perfect casting for Dean. And that’s what Dean and Frank and all of us used to sit around doing anyway, playing cards. AVC: That was the set where you learned to play gin rummy? AVC: Spending more time with the set than the actors is something people have accused Alfred Hitchcock of as well. How did he compare with Minnelli, in your experience? AVC: That was your first film. It must have been quite an introduction to the business. AVC: That was a before he fell into his love of icy blondes onscreen. SM: Oh, no, no. He was always into icy blondes and all that; I just wasn’t the type. So I was the little girl he would feed or something. I’m not sure what I was to him. AVC: Frank Tashlin, who you worked with right after Hitchcock, was another great stylist. SM: Oh, he was terrific, wasn’t he? He was really good. My God, you go back a long way. Whew! He was able to deal with Dean and Jerry [Lewis], because they were having a terrible time. AVC: How did he deal with them? By keeping them apart? AVC: It worked out that way for Jerry in the long run. SM: Yeah, and that’s what Dean walked away from. SM: Yeah, he needed to be the director. He needed to be the one whose word was law. So instead of an equal, comedic standup act, it was now Jerry finding his way into directing. AVC: It seems fitting that he invented video assist. SM: Did he do that? Maybe you’re right. Maybe that’s when “video village” got invented. I didn’t know that. That makes a lot of sense. AVC: For him it did, because it allowed him to play his own performance back on the set. SM: That’s right, but then it adds such time to the schedule, because you always want to do it again and make it your way, or better, or whatever. AVC: The Apartment is highly esteemed; Irma La Douce is a little overlooked by comparison. SM: Yeah, well, Irma should’ve been a musical. It was a big hit as a musical on Broadway and in France. I think Billy [Wilder] was intimidated by the music. He didn’t know what to do with music, so he cut it out. AVC: Was it different working with him on Irma La Douce than on The Apartment? Irma is a much more stylized movie, where The Apartment is more intimate and black and white. SM: It was different because on The Apartment, we only had 29 pages of script, and what he did was wait to see how the relationship and the chemistry and all that between Jack and me would develop, and then he wrote it accordingly. Actually, he put the gin scene in, where we were playing cards, because he knew I was playing gin with Dean and Frank all the time. And then in Irma, it was a much more peopled picture. Many more people, much more stylization. I think it was the same DP [Joseph LaShelle] too, the same crew. AVC: Carrie Fisher based your character on her mother, Debbie Reynolds, whom you know. Did you put your knowledge of her into the performance, or steer clear of that? SM: I didn’t think about her at all. I just did it like it would’ve been me. And, of course, Meryl [Streep] was nothing like Carrie. So we just did it as though it were a piece of art from the book that she wrote. AVC: You’ve had periods where you’ve acted more and acted less, but you’ve never really gone out of style in the way the character in the movie has. Did you ever think that might have been you? SM: Me? No, I’m not ditzy like that character. [Laughs.] Although sometimes people call me that because I believe I’ve lived before, but ditzy, I’m not. I don’t think you go out of style when you’re living in the present most of the time. And I think that is what I do. AVC: You seem to be suddenly attached to a lot of projects. SM: Oh, isn’t that the truth? 2012 is my year. I don’t know what that’s about. AVC: Is that just a coincidence? Did you decide, “I want to do more this year,” or did it just happen? SM: No, what happened—I don’t believe in coincidence. I think we plan everything, somehow, on another level. So I think 2012 makes sense because of all my beliefs that 2012 would be a really wonderful, good year for me. Just like 1984 was. AVC: Speaking of which, Terms Of Endearment was a huge movie at the time, and it still affects people profoundly. SM: Sure, of course. I think it was an honest—again, an honest mother-daughter relationship. I read the book, and it’s quite different than what Jim [Brooks] wrote, but he was so brilliant in terms of his interpretation and evaluation of mothers and daughters. I knew as soon as I read it [that] it was going to be important. I told him that. And we didn’t get the money for it for two years. AVC: When you got the chance to revisit the character later, were you skeptical about it, or did that seem like something you wanted to do right away? SM: Oh yeah, anything Aurora Greenway did, I would want to do, even now. I love that character. SM: We used to say Peter Sellers had a leaking aura, and all of the lifetimes he had ever lived were accessible to him at any time. And so he was never really sure who he was now, be cause he was all of them. He was an extraordinary actor.